To help highlight the importance of what I’m about to share, let’s start with a few statistics. 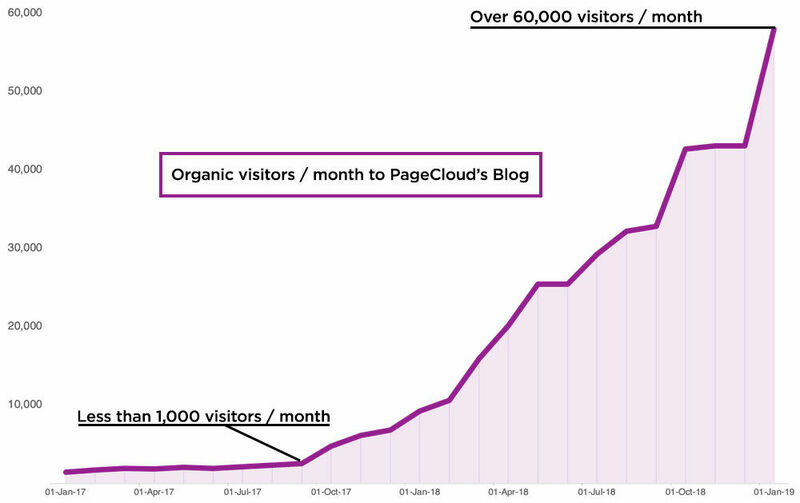 Back in May 2017, the PageCloud Blog was very similar to most blogs on the Web: it had interesting content, but wasn’t really driving any traffic from search. *Data from Google Search Console. Does not include visitors from social media, email, paid ads, or any other source other than organic visitors. In this article, I’m going to show you the step-by-step process that we followed to boost our blog performance without relying on a team or budget. Feel free to use this exact same process to improve your own site or blog’s organic performance. Note: Organic traffic can be considered a vanity metric if your target keywords aren’t related to your business goals, ie: acquiring customers. More on this below. The first thing we did was take an honest look at our blog’s content and its performance in search. Unfortunately, despite two years of active blogging and close to 100 blog posts, basically no one was coming to our blog organically other than people searching for “PageCloud Blog”. As this is branded search, we don’t count it as pure organic, and neither should you! A lot of SEO experts call this the “Spike of Hope, followed by the Flatline of Nope”. 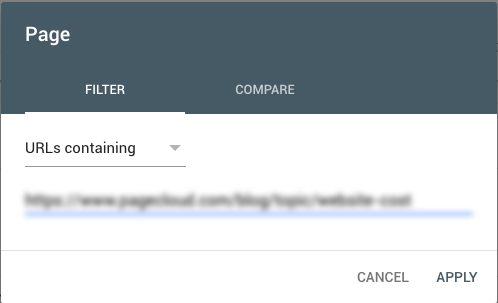 Export the past 12 months of Google Search Console Data into a Google Sheet. Sort the pages from least amount of clicks to most clicks. Once we got our Google Sheet set-up, we filled out the new columns on a page-by-page basis. To do this, we first needed to filter down to the page level in Google Search Console. KW Opportunities: by clicking on the “Queries” tab, we could see all the keywords that each page ranked for alongside relevant “clicks”, “impressions”, “click-through rate”, and “position”. The main goal of this exercise was to find relevant queries that we could be doing dramatically better on. 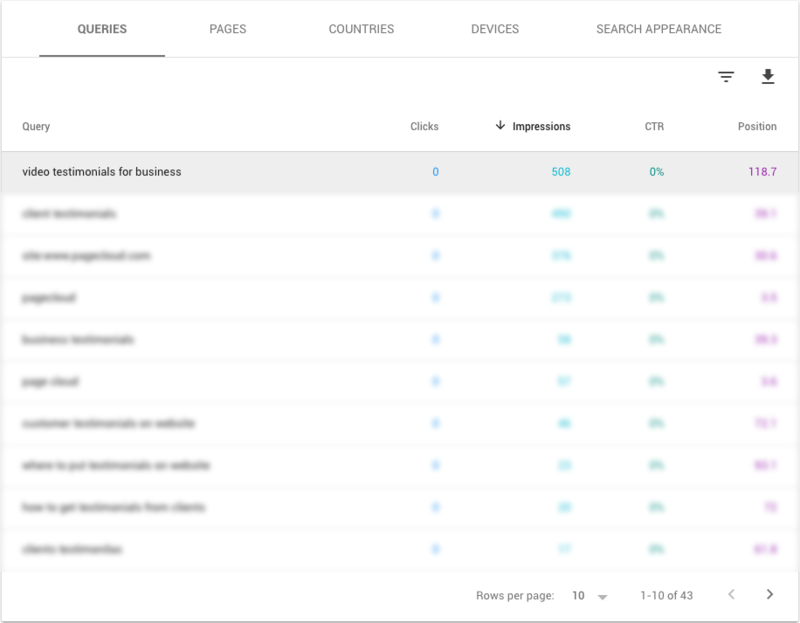 Typically, these keywords have lots of impressions and a very low CTR. Think of it this way, if Google is constantly showing your page in search for a given query and few people are clicking on it, you might just need to tweak your page title and meta description and to get a ton of additional clicks. For several pages, there were no keywords added. For others, there were 1-5. This was an important step as it allowed us to determine what we needed to do next with each blog post. Doesn’t rank for any relevant keywords. (low volume, no potential). The content isn’t used anywhere else or doesn’t drive significant traffic from any other source (email, social media, etc.). We used Google Analytics to determine this. The content is of low quality (users don’t get any real value from reading it). The page ranks for one or more high volume keywords that are relevant to the post but weren’t included in the page’s meta data. The content on the page is relevant and of high quality - doesn’t require modification. The page ranks for one or more high volume keywords that are relevant to the business. However, the article does not do a good job of satisfying the user query compared to top ranking pages. Two or more posts are competing for similar or identical keywords. Individually the posts are not ranking, but combining them would make for a much better article. *This is where the “Notes” column came in handy. We used the “find” (CMD or CTRL + F) feature in Sheets to find similar keyword opportunities and note the articles that competed for the same keywords. Page has high rankings for multiple keywords that are relevant to the article and the business. The content is of high quality and there is no apparent way to immediately improve it. 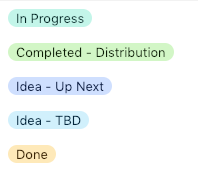 Once we completed, we immediately started taking action based on the “Next Step” column. Because this content was essentially of no value to us or our readers, we deleted these pages (close to 50% of our blog) and added a 301 redirect to the most relevant article or page. In most cases, this was our blog’s home page. Although this was a little scary at the time, this technique of purging low quality content has been proven several times. We worked on writing very compelling page titles and meta descriptions that aligned with the keywords that Google was already ranking us for. For inspiration, we typed in the keywords and looked at what other top ranking pages and ads were using for copy. This quick change had a huge impact on our blog’s performance. Although rewriting and merging blog posts together took a fair amount of time, it was definitely worth the effort. This process helped us increase the quality, length, freshness, and relevance of our articles - all important elements that Google looks at when ranking content. Another thing that we started taking more time to consider was our overall blog’s site health. Things like page speed, broken links, redirecting pages, incomplete metadata, and missing heading tags were not going to be tolerated moving forward. We wanted to optimize our pages the best we could so that technical SEO problems would never be an excuse for lack of performance. There are many free and paid tools you can use to accomplish this type of SEO check. Nowadays, we use Ahrefs Site Audit. Early results: A couple months later, when we finished the audit and refresh process, we were left with a blog full of high-quality posts that actually lined up with our audience’s search intent. We were now driving thousands of organic visitors per month. But we weren’t done yet, we still needed to figure out what was wrong with our existing content creation process and come up with a long term plan that worked. Back in 2016 and early 2017, PageCloud’s content creation process was pretty unstructured from an “SEO standpoint”. Like most businesses, the blog was being judged on quantity, not quality. At the time, we were aiming for 2 new blog post per week. The articles were typically pretty short (under 1000 words) and covered a wide-range of topics including: a day in the life at PageCloud, employee interviews, customer testimonials, online tips, and coverage of events like Techcrunch where PageCloud was a finalist. Content ideas came from everywhere: our writers, management, customers, etc. They were added in a Google Sheet and sorted by gut or by what made sense at the time. Like mentioned before, they all had one thing in common, they didn’t rank in search. For our long term plan to be successful, it had to consider the three pillars of modern SEO: keyword research, content creation, and backlink building. Before adding our target keywords into SEMrush (our SEO tool at the time that we later changed for Ahrefs), we first needed to figure out what keywords to target. 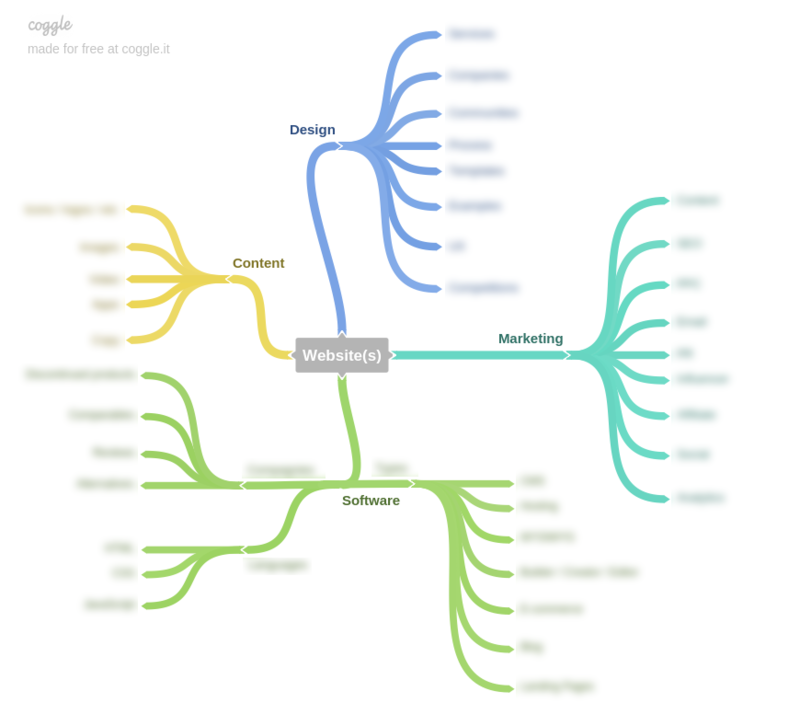 We started by brainstorming a bunch of ideas on a whiteboard that led us to create this mind map with a tool called coggle. The goal was to align the different topics and subtopics that our blog was going to target. Keyword ideas came from the research around existing content and competitors that ranked within these subtopics. The “parent keyword,” also known as the main keyword the upcoming article would target. Monthly search volume estimates in the United States for a given keyword. This initial metric gives us a quick overview of whether the keyword or topic is worth pursuing. If there is no volume, there’s no potential for organic traffic. If there is no way to at least mention our product, then we wouldn’t write the article. The more the article related to our product, the better. Over time, we noticed that conversion rates into trial also aligned nicely with this concept. This is how we avoid vanity metrics like total organic visits and focus on what will grow our business: number of trial starts and customers. Note: We implemented this idea in mid 2018 after watching Tim Soulo and Ahref’s “blogging for business course”. If the keyword was still worth pursuing, we’d add in the top 3 articles that rank for our parent keyword. This gave us an easy way to refer to what Google considers best in class and what will be required to outrank them. We used Ahrefs to estimate how much monthly traffic the top 3 pages are getting. This set a solid benchmark for how much traffic we could expect to get if we were able to rank our pages in the top 3. Keyword difficulty varies dramatically based on several factors. One of the most important factors is the quality and quantity of backlinks pointing to a site. This is why we added the number of linking domains for each of the top 3 positions. This helped us determine if the keywords are great opportunities or if they might be too difficult to go after at the moment. The status of an article helped us manage hundreds of keyword ideas. Whenever someone had an idea for a keyword to research, it would get added to the “To be determined status”. Then, if it showed promise, it got moved into the “Up Next”. While we worked on articles, they had the “In progress” label until they got published. Before going to the “Done” pile, articles spent a few weeks in the “Completed - Distribution” because we needed to promote, share, and build backlinks in order for our content to rank. More on this below. This was a great area where we added add notes in as we did our research. For example, if all the top ranking pages were outdated, slow loading, incomplete, had terrible designs, or something that could be improved, we noted it in there. Using a combination of research techniques and various sorting mechanisms, we were able to determine what content needed to be produced and in what order. We knew that to rank in search, we couldn’t just rely on creating high quality content. Let’s face it, there’s already a ton of that online. To speed up the ranking process, we aimed to create UNIQUE content that was BETTER than what was already ranking. This means that we couldn’t just rewrite the top ranking articles or make them longer, we had to take a long hard look at HOW we could make them significantly better without copying them. This was a really important because Google loves unique content. Highly clickable Title (60 characters) & Meta description (160 characters) that includes target keyword. Tips: use numbers, brackets, emotional or actionable words. Look at ads for inspiration. Once the article checked all the boxes, we hit publish and submitted it to Google. Even if you get your research and content creation down, you won’t rank for highly competitive keywords unless you do a good job at building backlinks. We realized this pretty early on. So, we signed up for BuzzStream and started experimenting with tons of outreach strategies. To this day, we still consider building backlinks to be the most challenging part of growing our website’s performance in search. The good news is that the more high quality content we produced, the more natural links we got. It makes sense because people naturally link to top rankings results. The more articles we ranked, the more links we received. SEO has this snowball effect; you just need to get it going in the right direction. Don’t pay for backlinks. Period. Most people will want to do a link exchange with you. Only do it if it makes sense for both parties (you don’t want to stuff low quality links into your content). Be genuine and avoid SPAM. 10 high-value emails are better than 1000 SPAM emails. Don’t be too upfront about asking for links. Instead, show people why they should care about your link and what value they will extract. The backlink should come naturally. Don’t follow up more than twice. Anything beyond that is SPAM. Get creative with your subject lines, emails, and strategies. There isn’t a single outreach strategy that works for everyone. Broken Link Building is one of our favorite strategies because there is an immediate win for the person you’re reaching out to. As you can see, the strategy we used over the past year or so doesn’t have anything revolutionary. There are no hacks, no gimmicks. It boils down to a structured approach that creates high quality content and consistent results. This exact strategy now gives us the ability to rank over 90% of the content we produce on page one of Google within a few months for our target keywords. If you're interested in becoming an SEO master, check out our comprehensive guide on everything you need to know about SEO. Feeling inspired to build your own SEO optimized website or blog?